Seneca Park Zoo Society Executive Director Pamela Reed Sanchez, left, and RIT Provost and Senior Vice President for Academic Affairs Jeremy Haefner sign a memorandum of understanding in a partnership to benefit the Zoo Society and RIT students and faculty. Officials from Rochester Institute of Technology and the Seneca Park Zoo Society have announced a new strategic partnership between the two institutions. The collaboration formally recognizes and builds upon a relationship that has existed for years and was formalized with a memorandum of understanding to develop, promote and implement mutually beneficial projects. The agreement will involve faculty members and students from RIT who can support the society’s operations. Many RIT students and faculty members have already worked at the zoo over the years from a number of disciplines, including environmental science, museum studies and new media and game design. Future collaboration may include students and faculty from hospitality, marketing, photography, K-12 education and more. One such opportunity is the Center for Biodiversity Exploration, which opens at the zoo this summer. With students in the fields of gaming, environmental studies, marketing and a host of other disciplines, a multi-disciplinary class at RIT has been working with Zoo Society staff to design, test and build an interactive experience to engage zoo guests in understanding biodiversity and environmental health for zoo guests. 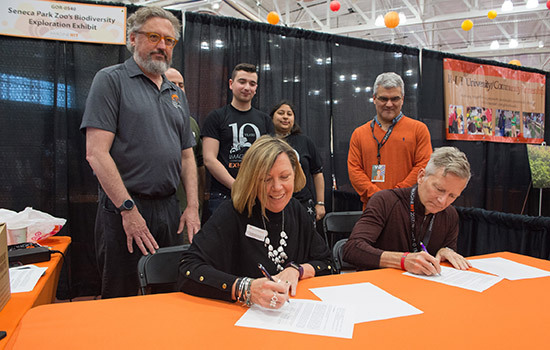 The partnership was signed by Reed Sanchez and RIT Provost and Senior Vice President for Academic Affairs Jeremy Haefner during the Imagine RIT: Innovation and Creativity Festival on May 6. Also present for the signing were Natalie Alfke, a 2016 RIT graduate in 3D digital design, and Miguel Murphy, a third-year School of Individualized Study major from North Stonington, Conn. Both were employed by the Zoo Society, as a graphic designer, and programmer and developer respectively, working on the Center for Biodiversity Exploration experience. “We want our students and faculty to be engaged in helping the greater Rochester community thrive. We do this by seeking collaborative opportunities where the university can partner with community organizations like the Zoo Society to achieve mutually beneficial goals,” said James Winebrake, dean of RIT’s College of Liberal Arts.